Captain Zero has enhanced strength and durability and can control dark matter. He wields a double-bladed sword and is an extremely brutal and skilled hand-to-hand combatant. Captain Zero was created, along with Madam Infinity, by the villainous War Chess in a successful attempt to clone Captain Infinity and Madam Zero, the leaders of the primary forces for good and evil, respectively, in the Infiniverse Reality. He was one of War Chess’s most trusted and most powerful minions and he assisted the mega-villain in the colonization and takeover of Marz Zeta, the second most populated planet in the Infiniverse behind Super Earth One. Captain Infinity’s Infinity Force and Madam Zero’s Army of Shadows, as well as Centuria’s Centurians, had been involved in the War for Eternity which was prophesied to eventually end in the destruction of the Infiniverse. All followers of The Light would be migrated to the new world, while those who remained in the shadows, would be left to be destroyed. These sets of consequences, at this point, however did not have much bearing on Captain Zero, for after spending a long time battling heroes alongside War Chess and Madam Infinity, an especially brutal encounter with the Infinity Force on Marz Zeta had ended with his – and Madam Infinity’s – destruction. Their mortal death had transported the two of them to the Shadow Realm, which was populated with hundreds of the most vile deceased individuals from a number of realities and realms, and this was to be the place they remained for the rest of eternity. With that in mind, Captain Zero and Madam Infinity, exerted their dominance and took over the Shadow Realm. Captain Zero’s strength and control of dark matter made it impossible for any other being in the Realm to question his authority. His ambitions however changed when The Eternity Key appeared on Super Earth One. It’s primary purpose was to open a door to a new world at the time of the Infiniverse’s destruction, but once the Key was prematurely used by the Centurians to restore Sapphire Shade’s previously lost powers, a door to the Shadow Realm was opened. Madam Infinity used that door to jump back into the Infiniverse and send almost all members of the Army of Shadows and the Infinity Force into the Shadow Realm. A massive battle ensued as Madam Infinity commanded the minions of the Shadow Realm to attack and destroy Captain Infinity, Madam Zero, Centuria and all of their respective followers. 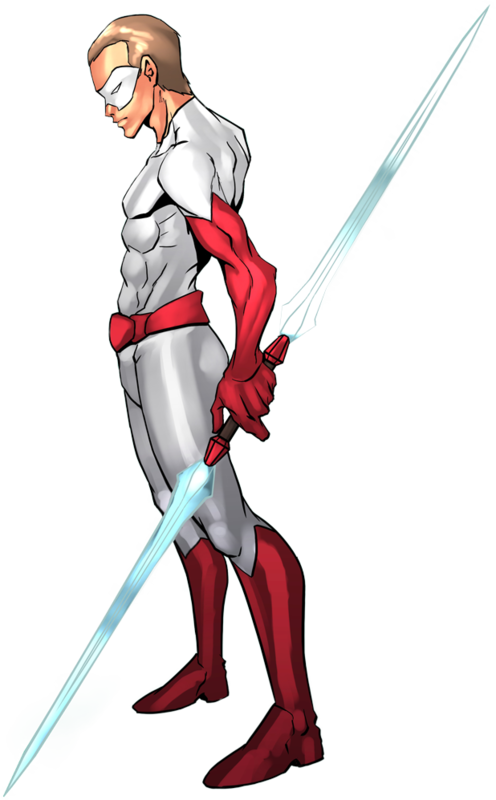 Captain Zero of course was no mere minion, but he was more than willing to take part in the fight as he wielded his double-bladed staff against villains like Arrowhead, Touchscreen and Bombard, as well as heroes like Miranda Miracle and Crosscheck. But he took his greatest pleasure in confronting the man himself – Captain Infinity. As the two of them came face to face the leader of the Infinity Force pleaded with this semi-clone to call for a halt to the attack then announced that if everyone laid down arms and followed The Light, he could perhaps use his powers to give a second chance to the Shadow Realm minions and migrate them all into the new world. A few of the minions heard this and surrendered themselves. Madam Zero also heard this and began to wonder if it was worth committing herself to The Light even if simply for the purpose of saving her own life. Captain Zero however wanted no part of the second chance. He was single-minded in his goal to destroy Captain Infinity, or at the very least, strand him in the Shadow Realm. And after exchanging a series of blows, Captain Zero found his opening and was able to drive one side of his double-sided blade through the gut of the Defender of The Light! Immediately, Centuria, and others converged on the Shadow Realm King and attacked. He fought back with ferocity and used a series of intricate moves to disarm and disable several Infinity Force members. To everyone’s surprise it was Madam Zero who jumped in and engaged the semi-clone. Madam Zero was one of the few Super Earth One hyper-beings who could harness the energy of the Shadow Realm and increase her strength and abilities. She came at Captain Zero with aggression and the two of them crossed blades in a thunderous exchange. Soon, however, he was called away as another squad of heroes had entered the realm and put Madam Infinity in a compromising position. It was the mighty Infinity Force hero Spectra! Her telepathic powers were proving to be a bit much for the Shadow Realm Queen to handle. Captain Zero swooped in and went after the hero with a combination of lighting quick moves. Spectra was forced to defend, and thus cease her psionic attack on Madam Infinity, giving her a chance to recover. She re-entered the fray and the two of them came at Spectra from both sides. The hero deftly defended against the assault, and moved ever closer to obtaining her goal of getting the Eternity Lock and sending everyone back to Super Earth One so they’d be ready for the migration to the new world upon the Infiniverse’s destruction. Realizing Spectra’s abilities and skill would eventually overwhelm him and his queen, Captain Zero took a different approach and grabbed the Eternity Lock to protect personally. He then made a break for it, as the Infiniverse was beginning to crumble and once that happened, it wouldn’t matter whether or not the Eternity Lock could be opened; all of them would be stranded in the Shadow Realm. Spectra however pushed herself harder than she ever had, blasting through dozens of Shadow Realm minions, and running Captain Zero down. Then, after a quick exchange, she found an opening and used her sai weapons to pin the Shadow Realm King against the side of a jagged mountain base. She then took the Eternity Key, flew back to the others and opened it, allowing Centuria, Crosscheck, Radiance, Sapphire Shade, Fracture, Eclipse and all other followers of The Light to journey back to Super Earth One. Captain Infinity was the last of the heroes to approach the portal. But as he and Spectra prepared to walk through it, they turned to see that Madam Zero and her team were still locked in desperate battle with Madam Infinity and the Shadow Realm hordes. In fact, it was quite evident that the Followers of the Light only made it to the portal because The Army of Shadows were keeping the minions at bay. Time seemed to stop as Captain Infinity and Madam Zero made eye contact… The Defender of the Light extended a hand in her direction, suggesting that she come along with them. A million thoughts ran through Madam Zero’s mind as she considered the possibility of turning to The Light, escaping the Shadow Realm and migrating to the new world. Then she looked past Captain Infinity and through the portal behind him… Super Earth One, her homeworld, was already crumbling. And that was a sight she just could not bare. She looked back at her mortal rival one last time and mouthed the word “go.” And with that she turned and jumped back into the middle of the fray against the Shadow Realm hordes.